Woo-hoo. Summer is awesome. If the bacteria at the beach don't give you hepatitis or diarrhea, you could still experience cramps, vomiting and existential dread, thanks to jellyfish… and the impending jellyfish apocalypse. Last week we found out that many of America's beaches are filthy. Today, James West, reporting for Mother Jones, informs us that in many places, there are more jellyfish now than ever before. One recent University of British Columbia study concluded that "jellyﬁsh populations appear to be increasing in the majority of the world's coastal ecosystems and seas," and blamed human activity for these blooms. In addition, the prediction is that jellyfish may do really well with climate change; the warmer the water, the more their blobby little bodies love it. An expert says that, especially on the East Coast of the U.S., we will probably see jellyfish show up earlier in the season and stick around longer, waving those tentacles around in the air like they just don't care. 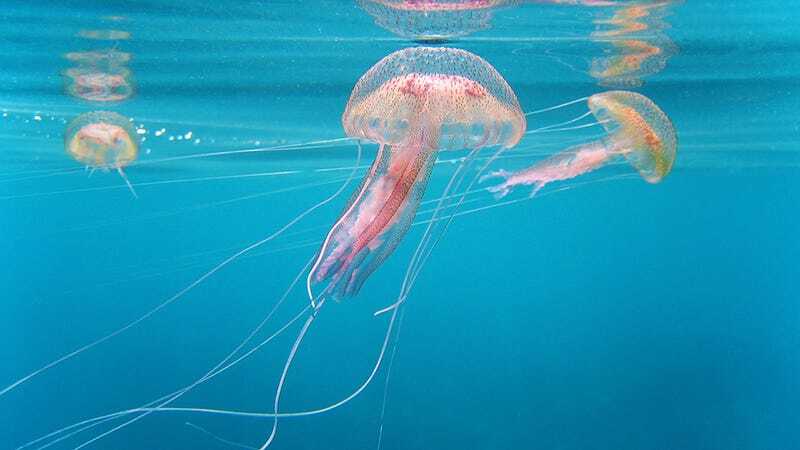 A single brush of the Irukandji jellyfish—in the box jellyfish family—can cause searing pain and cramps, inducing nausea and vomiting which can continue for 12 hours, and more insidiously, an existential dread: Victims are "gripped with a sense of 'impending doom'." To quote my colleague here at the HQ, "That sounds like my period." Sigh. Beachlovers, we have no choice but to welcome our new jellyfish overlords.